However, a group of anti-Sibyl terrorists arrive in Japan, and the Ministry of Welfare's Public Safety Bureau discovers significant evidence that the invaders are being aided by Shinya Kougami, a former Enforcer who went rogue. Because of their past relationship, Akane Tsunemori is sent to SEAUn to bring him back, but with their last meeting years in the past, their reunion might not go quite as planned. Psycho-Pass Movie won the Newtype Anime Award for Best Film in 2015 and was nominated for the 47th Seuin Award in the Media Category in 2016. While Psycho-Pass: The Movie is a continuation of the story from Psycho-Pass Seasons 1 and 2, it changes a lot of the things from the show: the setting is different, and while Kogami is brought back again, many of the characters are new. These changes may be fine for some fans, but disappointing for many others. What results is still a great standalone movie, but may alienate many fans because it doesn't entirely "feel" like Psycho-Pass. Undoubtedly the high point of the movie. The painstakingly-animated cityscapes and landscapes simply made my jaw drop. And the fight scenes - oh my god, the fight scenes. I don't think I've ever seen fight scenes as well animated and choreographed in an anime as in this movie. The animation budget was probably very high for this film, and it shows - the animation is better than it was in the show. It may not be "Spirited Away" or "Ghost in the Shell" awesome, but certainly up there as one of the most well animated movies ever. One thing to note about the art though: there's a bit more violence in this movie than in the show. When people are shot with guns or Dominators, the blood splatters and body explosions are animated in detail and often focused on, and internal organs and body bits can be seen. If guts and gore turn you off, you may want to avoid the movie. The music and sounds do their job very well. The soundtrack mostly consists of the traditional orchestra and chorus you've come to expect, and adds tension to the story when needed. The OP and ED are both energetic rock songs, and get you pumped before and after the film. However, there's nothing outstanding about them. The music isn't something I'd listen to over and over again on my iPod, but it definitely contributed to the enjoyment of the film. The sound effects are also very well done. The voice actors do a great job as usual. One complaint I have about the sound though, is the excessive use of ENGRISH. Some people won't mind the terrible pronunciations, but because entire dialogues in the film are in Engrish, it will be at best a bit distracting, and at worst make some parts hard to get through. The story is one of the weaker points about the movie, especially since we've all come to expect a strong story from the show. You know those anime films that seem epic at the start, but by the end nothing really changed about the overall plot or characters and you could go right on to the next season without watching the movie and not have missed a single thing? This is one of those movies. Unlike the previous 2 seasons of the show, this movie does not take place in Japan, but in another Asian country where the military regime is trying to implement a Sibyl-like system in an effort to keep the populace under control. Guerilla rebel forces resist the corrupt government, but thanks to Sibyl's system marking all opposition as criminals, the government is able to firmly control its people with brutal oppression. So where do our heroes fit into all of this? Well, it turns out Kogami is discovered to be aiding the rebels, and Akane is sent to investigate both his actions and the country's use of the Sibyl system. In essence, the movie is an exploration of what happens when Sibyl falls into the wrong hands. Questions about the political and social implications, such as persecution and segregation, are raised by the movie. The problem though, is that the movie is never given enough time to actually probe into these questions, instead choosing to focus more on the actions scenes than on answering all the thoughtful, philosophical questions it raises. Furthermore, the movie seems to have switched the genre of the series. Whereas the show was clearly a Sci-Fi Thriller with some action sprinkled in, the movie feels more like an Action Spy flick with some Sci-Fi elements mixed in, a change which may turn some fans off. One final problem with the story was the somewhat unsatisfactory ending. I won't spoil it, but I will say that I was a little disappointed with it. While fan-favorite character Kogami is back and better than ever, new characters that the audience are never given time to get to know or get invested in are also introduced. There is some character development: it's a joy getting to see the new Akane interact with a somewhat changed Kogami. Ginoza's reunion with Kogami is also interesting. Unfortunately, the side characters don't get that much screen time, so apologies to fans of any team member other than Akane and Kogami. Anyone hoping for Ginoza or one of the other team members to play a major role will be sorely disappointed. As I said, the film's main focus were definitely Kogami and Akane, at the expense of all the other characters. The film's villains do their job, but none of them is nearly as memorable as Makishima from Season 1 (who makes a short cameo appearance, BTW). So if you're only in it for Kogami and Akane, then you're in luck. Otherwise, the rest of the characters do their job - nothing more, nothing less. Despite all the flaws in the story and characters that I pointed out, the film was by no means bad. I thoroughly enjoyed it, and wholeheartedly recommend it to both fans and to anyone who is interested in Sci Fi or action. Throughout the movie my attention was held, and the 2 hour running time flew by. The movie didn't feel like a drag at all, which is a testament to its entertainment value. It's not as deep as the show, but sit back, relax, and you'll enjoy it. Don't let the cons I listed stop you from watching the film, however - with absolutely gorgeous animation, a beautiful soundtrack, and the best fight scenes in anime I've seen in recent years, I still wholeheartedly recommend this movie. Just don't go in expecting it to be the "good old Psycho-Pass adventure" with all the characters you love and you'll have a good time with it. This review contains minor spoilers, but really now, if you've watched the previous seasons you already know the plot to this one. Psycho-Pass was one of those shows that was good on premise, but in execution was handled quite poorly, with the subtlety and writing of an angsty teen who thinks it's cool to see guts and explosions and who thinks it's good writing when a character randomly references old works of literature. Still, it was a fun and enjoyable show with some funny moments (Brains, Hyper-Oats, Spooky-Boogie etc). Psycho-Pass 2 on the other hand felt like an unnecessary cash-in that didn't bring anything new in terms of plot (and in fact recycled many of the plot points that kept the first one so interesting in the first place). Back then, I chalked it up to them not having the original writers onboard, perhaps the newer writers played it safe and didn't want to innovate and that since the movie brought back the old writers, surely they'd learn their lessons and bring something new to the table right? Or so I thought. Boy howdy how wrong I was. If you've already watched the second half of Psycho Pass 1, you've pretty much already seen this one. It's pretty much the same premise, with the same plot twists and revelations only in Cambodia as opposed to Japan. And impressively, it manages to have even worse writing than the first anime. Akane, once again, proves to the viewer that she's still a naive nutcase who thinks the system can change for the better (it doesn't) and is strangely easy to trust otherwise an obviously evil Colonel. When Mika of all people calls you out on your nativity, you seriously should consider retiring from the position of Main Protagonist. Kougami on the other hand is still the same old Kougami you've remembered from the first season, only cranked up in terms of OPness. This guy could take down an entire military with a sniper rifle without breaking a sweat. Because of that, most action scenes lose their sense of tension when your character is piratically invincible thanks to plot armor. The other characters from previous seasons hardly make an appearance (understandable) apart from a terribly shoe-in cameo near the end (not understandable). As for the villains, we have Araragi Ko- I mean Colonel Wong who looks like he took a break from his usual harem anime shenanigans to try his luck at the Psycho-Pass-verse. At least that's what I remembered him doing. The other villains suffer from the strange syndrome of "looking cool but ultimately useless". I mean, you have a chick who can make wires grow out of her arms, how incompetent can you be to undersell this cool character? Of course nothing ends well for them, they also suffer from Bond Villain Stupidity so much you won't be the least bit surprised when Akane's friends show up at the precise moment to save them. Makishima wasn't the best villain in anime ever (face it, reciting quotes from random works of literature a good villain you don't make), but he was at least interesting and he had goals. Sybil System is less interesting now the viewer is aware of their true nature, and Araragi has no motive at all. Really, that's pretty much the major things wrong with the film. I could go on about the other minor flaws plaguing the film (Engrish, Minor Inconsistencies, Plot Conveniences), but watching the film really wore me down, and nitpicking on minor issues would require me spoiling the whole film scene by scene. Animation is good at least. I like Psycho-pass. It's an interesting franchise that doesn't have any kind of moe and doesn't involve high school teenagers with supernatural powers. It's a really good thriller-mystery show with some really deep characters and good philosophical themes. I really enjoyed the first season and I loved the second one (though I was probably the only one). Yet I didn't like this movie as much as the predecessors. At first let's start with the story. The thing that i liked about this film was the fact that it expanded the already interesting world of Psycho pass. The biggest part of the movie doesn't take place in the futuristic Japan like the two previous anime series but in another country were things didn't develop as good as with Japan. That way we have a really interesting place to get the story started. The plot itself was good enough even though in some moments I was starting to loose interest. Generally speaking the movie is kinda big in length (almost two hours) as a lot of things open up and need to be closed with the ending.Also the philosophical aspect of the two first seasons is almost gone as this movie targets mostly in the action and a little bit in the political thriller genre. The animation is really good but for Production IG the best animation studio in Japan for me there were some flaws. Basically the animation was kind off awkward in some hand to hand combats. But overall it was really amazing. Now for the sound. Let the rant begins. I am not one of those people who have complex about locations. If an anime is taking place in England for example, I don't mind if the characters are speaking Japanese. But when an anime is trying to add English dialogues in it's script is always welcome with the requirement of course that the English are at least GOOD. I'm not asking to speak fluent English (hell I can't even write fluent English XD) but in this movie were a major part of the dialogue was in English this thing was unbearable as most of the voice actors couldn't speak English at all. And ok I could excuse the fact that Kogami's couldn't speak good English because he is a main character in the franchise and they couldn't change his voice actor. But for the characters that appeared for the first time like Nicolas or the mercenary team they could at least take some voice actors that could speak better English than the abortion that I was hearing from them.Maybe I would forgive it if the film was made by another studio but Production IG has a history of shows with really good English dialogues like ''Higashi no Eden'' and ''Blood the last vampire'' so this was unforgivable for me. Just make them speak Japanese for God's sake!!! Apart from that the voice actors were generally really good and the same goes for the OSTs too. The film starts with song of people's now favorite band Ling Toshite Shigure which was good but not their best in my opinion and ends with the awesome song by Egoist ''namae no nai kaibutsu''. But for the horrible ''engrish'' I put a 6 in the sound section. Hell some sideshows were speaking way better English than the main characters!!! And lastly we reach the character section. I'm not a fun of Kogami (yes he appears it was obvious from the trailer so it's not a spoiler). I find him too perfect for the fucked up word that Psycho pass is displaying. But it was nice to see the other characters like Akane, Gino and a special someone near the end who makes a brief but memorable appearance that I believe all of us we were expecting. The other movie-exclusive characters were good enough but I was disappointed with the mercenary team who were all really interesting characters but apart from their leader none of them is being discovered at all. 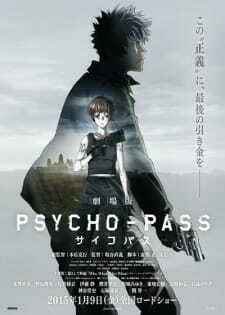 Overall ''Psycho Pass the Movie'' was an enjoyable entry in this franchise. I don't believe it will be the last especially after seeing the last scene after the credits. It's good if you want to see 2 hours of action with a little bit of political thriller on it but don't expect to see any philosophies like the two previous seasons. I would recommend this movie to the fans of the franchise but don't go with high expectations. But I guess I shouldn't be the one to talk. I was somebody who loved the second season after all XD. The movie is enjoyable in reliving the strengths of our favourite characters and shows their capabilities in adapting based on Sibyl system continuous progression for evolution. The story allows the viewer to get a glimpse of the characters' improvements and strengths that speak volumes of their years of experience. However, the storyline played an unfamiliar tune. Psycho-Pass season 1 and 2 focused on individuals that brought forward an opposition against the system. By exploring a world where we are introduced to the different types of people accepted or denied by the society, we are treated with a myriad of perspectives and social psychological warfare. It was a show that focused mental strength and intelligence. The movie, on the other hand, heavily focused at bringing out the "Brains" counterpart: raw muscle strength; the fighting force of an army, the individual and the people. Because of this, the storyline of the movie was simplistic and a "lazy" attempt at uplifting what the show was supposed to explore. It was a simple goal, a simple manipulation and eventually, a simple solution handed on a silver platter at solving the crisis. There were no individuals or groups that were forward-looking and thought-provoking like Makishima or Kamui; in this sense, no solid antagonist to bring out the potential of a thriller. One could argue that this was because the two antagonist from the series were accustomed to the system and knew how to play by the rules to cunningly twist around with it, while the movie was set in a world who was very new to Sibyl System, therefore their aims fall short to the visions presented in the series.